The beginning of January.... This is the time to start over with a fresh page in our journals and write a new story for ourselves. I don't know about you, but my mind always drifts towards the topic of Organizing when the New Year arrives. 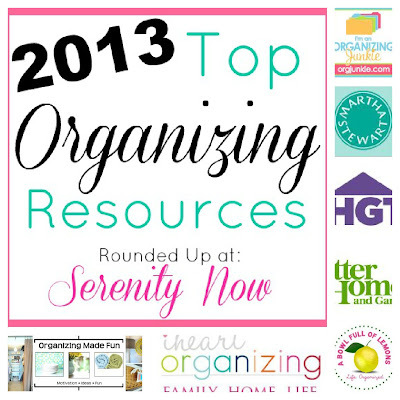 There are some specific things I want to work on organizing this year, so I thought I'd round up some of the very best Organizing Resources to share with you today! A fabulously easy to navigate site--printables, schedules, tips, menu planning, and more! Jen shares organizing charts, beautiful inspiration photos from her home, and she's been featured in BHG...what's not to love? Becky, who has guest posted here at Serenity Now before, has some wonderful series that you'll want to click through, including 31 Days to Cheaply Organize Your Home. She regularly shares inspiring ideas to help you kick-start your organizing. This blog ties in with Becky's printables shop, but she regularly hosts organizing challenges and offers free downloads. A great site with binder tips, menu planning ideas, cleaning instructions, etc. There's a printable for every facet of housekeeping and organization! Series, budget ideas, emergency preparedness tips, challenges, and more! This list is by no means exhaustive, but I did the leg work to round up some great resources for you. Get your Pinning fingers ready, because there are a ton of tips on these sites that you'll want to Pin or bookmark for later reference! What's your biggest organizing challenge for 2013? Getting all my Christmas decors down and organized! Thanks for the tip Amanda! Happy 2013! Pinning it! This is on my mind constantly! This is a great post! Thanks for sharing all the links, I'll be checking them out when I have a few minutes. Thanks for all the links..my biggest organizing challenge is PAPERWORK! !It is taking over my life and my house. Yikes! So I will be visiting these site and blogs to get some ideas!! I have to get my craft room organized soon! It is a HUGE disaster and I can't be crafty in such a messy space! Super helpful post! My craft supplies are a nightmare! I can't find anything so I keep buying things I already have! Definitely my main organizing goal for 2013!